The sample tuner can be used to tune melodic instrument samples to a given note. Applying the sample tuner to all melodic samples of the same module can help getting rid of detuned samples. The whole sample (or a selection) is analysed using autocorrelation to find its fundamental frequency. Thus, if you have a sample that consists of more than one distinct note in some way (e.g. a whole melody), you should reduce the sample selection to exactly one note for analysis — otherwise, the algorithm cannot decide properly which of the notes is the base note that should be considered for finding the fundamental frequency, as there will be several predominating frequencies. The sample tuner does no resampling - it merely changes the middle-C frequency of the sample. Finding the fundamental frequency may not work well if the sample frequency is too low. If the results are not satisfactory, increase the sample frequency and try again. 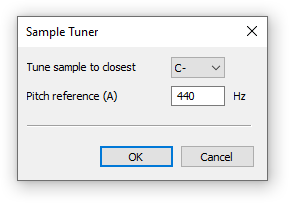 If the above instructions are considered, the sample tuner is easy to use: Simply select a target note to which the sample should be tuned and a pitch reference. In most cases, you would not want to change the pitch reference, since many real-world instruments are already tuned to 440 Hz, but if you wish to use a different tuning, you can of course do so. This page was last edited on 13 December 2016, at 01:14.